Nico was born in Cologne on 18 October 1938. She grew up with her mother in Lübbenau, a small town in the eastern part of Germany, before moving to Berlin where she began modelling which allowed her to work between Berlin, Paris, London and Rome. It was in Rome where she had her first movie appearance as 'Nico' in Fellini's 'La dolce vita'. In 1959 she moved to Paris where she had an affair with Alain Delon and gave birth to her only son, Aaron Christian, in 1962. In London she met Brian Jones and recorded her first single, produced by the manager of the Rolling Stones, Andrew Loog Oldham: "The Last Mile/I'm Not Sayin'". When she began modelling in New York for Eileen Ford, she fed on amphetamines and speed. Bob Dylan introduced her to Andy Warhol and his new project, The Velvet Underground. She sang three songs on the Velvets' debut LP and played roles in several Warhol films, such as 'Chelsea Girls' and 'I, A man'. Warhol was fascinated by her androgynous look and her beauty. 'Chelsea Girl' (1967) was also the title of her first solo LP. In California she fell in love with Jim Morrison who encouraged her to write her own songs. John Cale produced her next two albums, 'The Marble Index' (1969) and 'Desertshore' (1971) where she played harmonium and sang in a deep hypnotic voice. The seventies found Nico back in Paris where she lived with the avantgarde filmmaker Philippe Garrel. Films like 'La cicatrice intérieure' (1971) and 'Les hautes solitudes' (1974) had her play the main character and at the same time featured her strange beautiful music. She published another record, 'The End' (1974), including her interpretation of the Jim Morrison song. By this time she was addicted to heroin. After splitting up with Garrel, she lived in Manchester, partly with her son Ari, and toured all over Europe. 1981 brought first-issue of the LP 'Drama of Exile'. In 1985 she recorded her last studio record, 'Camera Obscura'. In 1988, she spent the summer in Ibiza where she died in a bicycle accident, 18 July 1988. Her ashes are now buried in Gruenewald at Wannsee in Berlin, along with her mother. 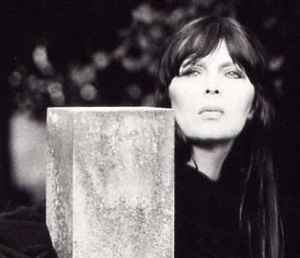 Several posthumous records like 'Hanging Gardens', 'Fata Morgana: Last Concert' and 'Nico Icon' reflect the quantity of admirers the chanteuse still has.